There was a period I can recall when I would often have dreams of enclosed spaces — like halls, passageways, rooms connecting to other rooms. But these rooms and hallways continued seemingly forever, connecting one to another on and on. There was not a sense of claustrophobia exactly because, as I say, the space seemed infinite. But nonetheless it was still enclosed — indoors — without windows and so no sense of outside. I don’t know what it means. 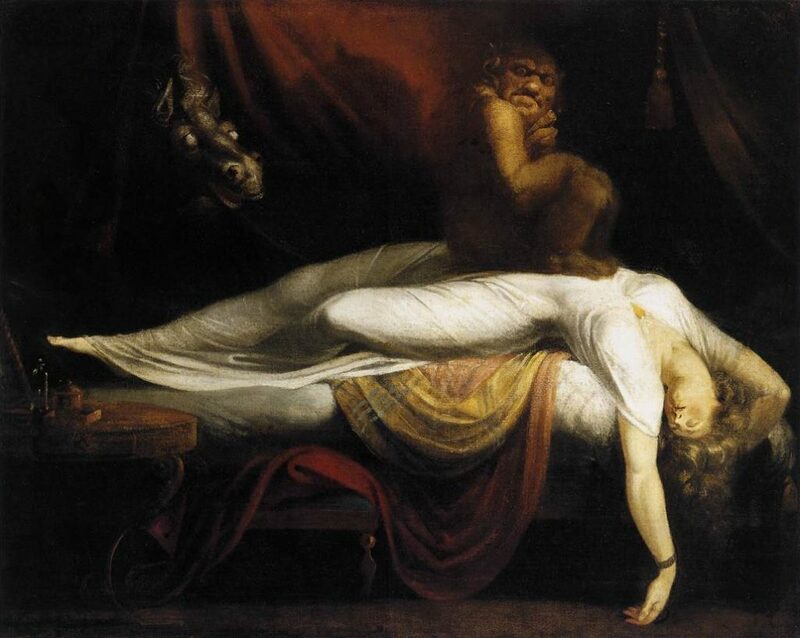 I don’t believe that dreams are disconnected from the psyche — I think they are part and parcel with the subconscious. This is of course still fascinating to me as it seems to be another means of peering into the subconscious (if that is what it is): like a shadow of the mind being cast on a screen revealing a different aspect of the mind. 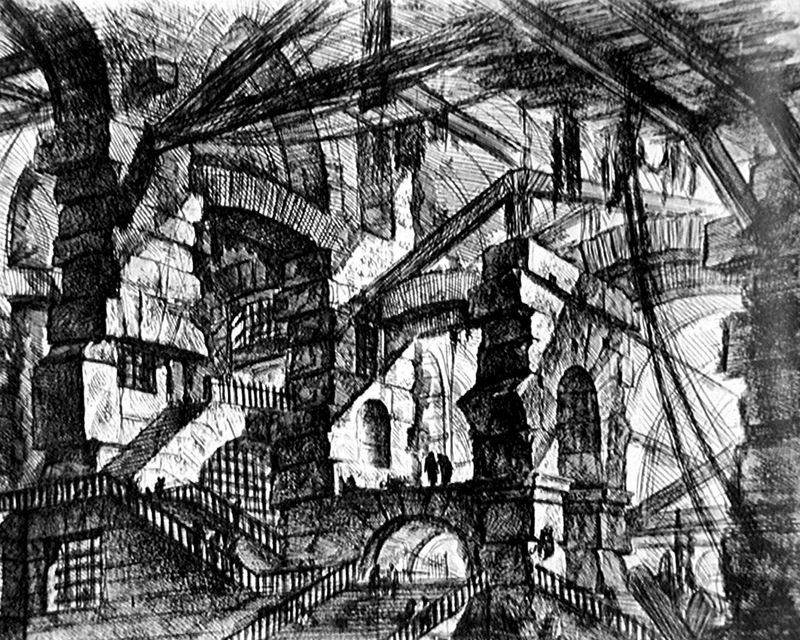 And so when I saw the vivid drawings of Giovanni Battista Piranesi of his own visions I saw a sort of kindred subconscious. 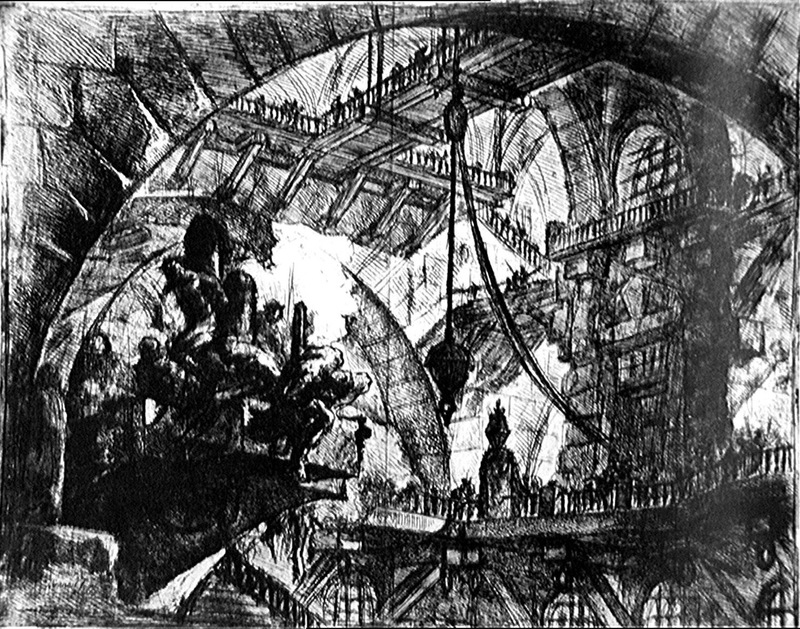 The huge but seemingly subterranean spaces he depicted looked immediately familiar to me. His spaces however are gothic — of stone and huge timbers. In my dreams the passageways were carpeted, wallpapered. 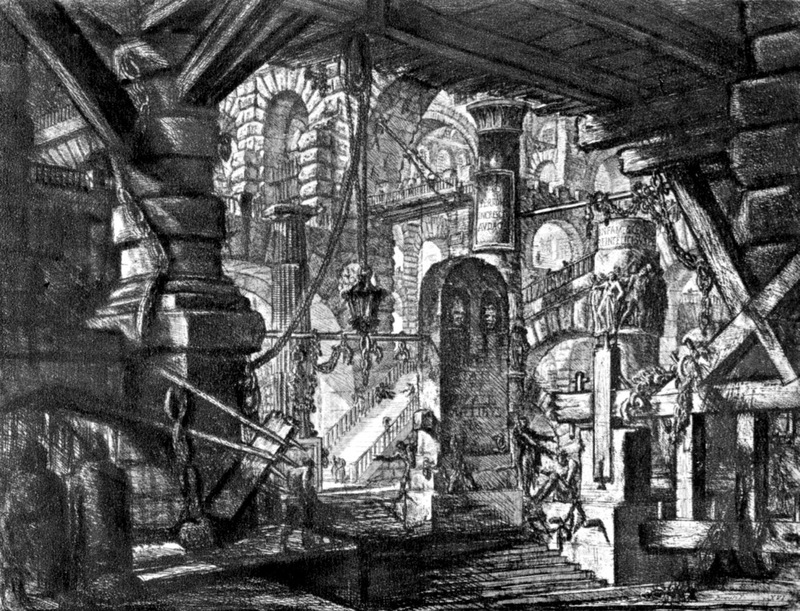 From what I read about him he was, as you may have guessed from his name, an Italian architectural artist who lived during the 18th Century. 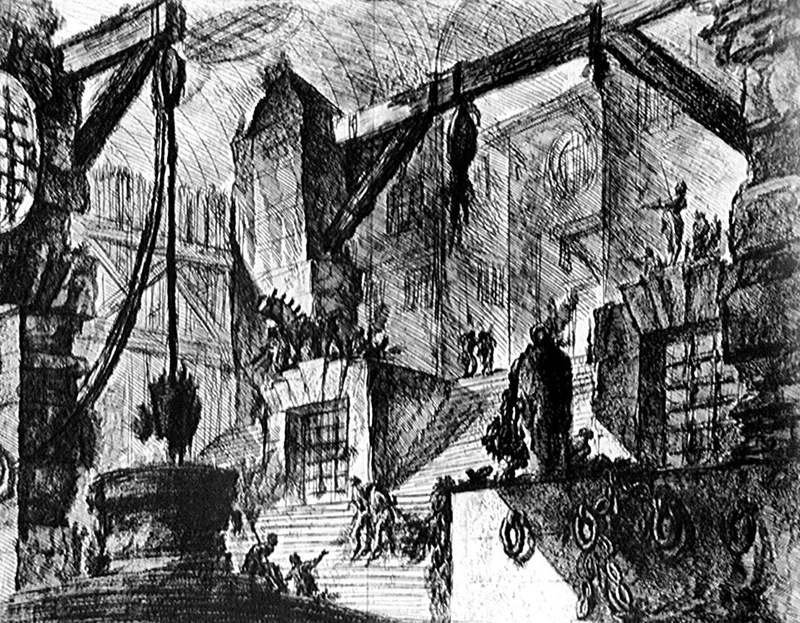 While he has many published engravings and etchings depicting Rome and other buildings of the ancient world, he is also famous for sixteen works that depict “imaginary prisons” (Carceri d’invenzione in Italian). The drawings came about, it is said, as a result of a delirium or fever that Giovanni experienced. In many of the images there is a sense that these huge spaces are still under construction — perhaps eternally under construction. Iron bars, gallows-like trusses suggest imprisonment and torture. 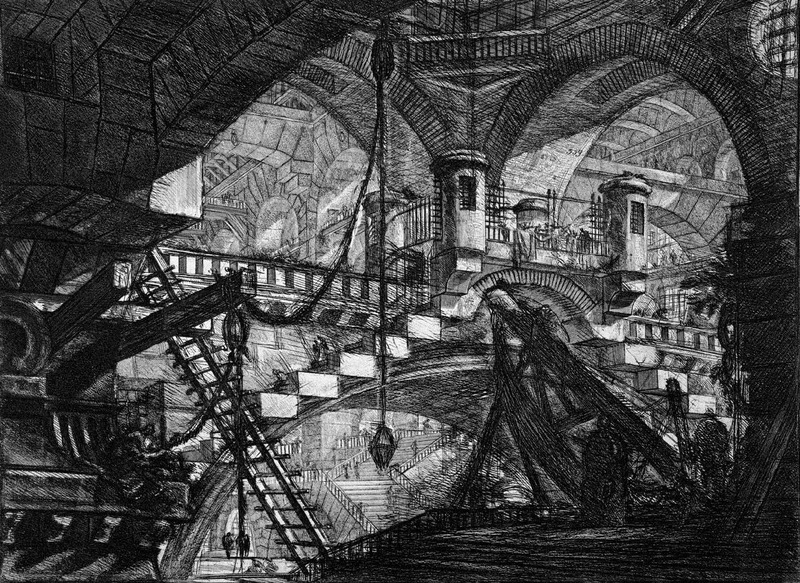 And always such a sense of scale — like you might imagine dungeons in Hell. So many 45 degree angles give the images an almost orthographic look. No doubt you will see a similarity to M. C. Escher in the above image. Labyrinthian, like the mind perhaps. If you scrolled down this far, I have saved something special. 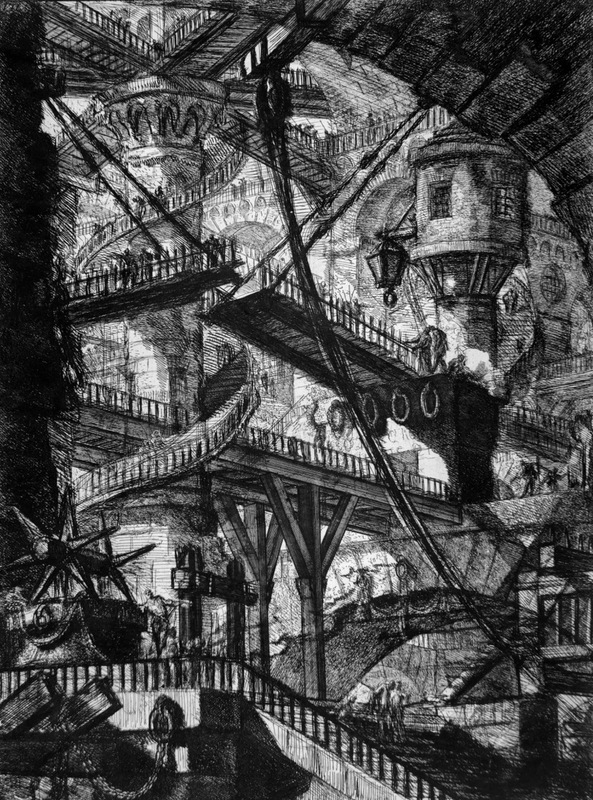 While a little on the long side, the way the two-dimensional etchings of Piranesi are reimagined in three dimensions in the following animated short makes them seem even more terrifying. Good job, Grégoire Dupond.